As the plane banked steeply on the approach to Madrid Airport I anticipated what lay ahead – 50 miles of running through the trails, brush land and woods that surrounded the city and a finish at the iconic four towers that lay at the heart of Madrid’s financial district. I was less worried about the distance than the cut offs – I had been struggling with these recently and so it was more important than usual to make sure I nailed this one. After all I had dropped at the 32km mark on my previous trip to Spain a few months earlier at the Sierra Nevada Ultra. That day Spain chose to bask in the hottest temperatures ever recorded (48.5c) and I remember all to well that the temperature at the start line was already in the high 30s and that was at 6:30 am! Enough excuses, back to the job in hand. I had 13 hours to run the fifty miles and whilst that might sound generous there were a lot of ups and downs as well as trying to find my way at night. There was a particular vicious cut off at the marathon mark as I guess this is where the organisers wanted to whittle the field down to those who were up to doing the night section which would be demanding for everyone. As seems the norm nowadays, registration was held the day before and I chose, rather stupidly, to walk the 13 miles to the venue rather than take a bus, but it was a beautiful albeit chilly day and I had to make a rather special purchase en route! Every time I go on one of these jaunts I seem to leave something behind and this trip was no exception. Sitting on my bed at home was my Suunto Ambit together with the printed list of absolute, “must take”, essentials. Bearing in mind how important the timing and pace was going to be on this one I had to buy a replacement and it just had to be Suunto, I told myself as I handed over my credit card to a gleeful Alfonso in the watch shop, with a tear in my eye. 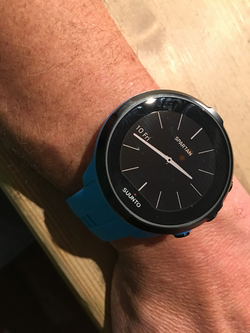 But the pain of parting with the cash was soon forgotten as I proudly sported my gleaming, azure blue Suunto Spartan Sport. Race day dawned and it was an early start to the bus station where I would pick up the transport to Manzares el Real and the start line. It’s worth mentioning at this stage, the brilliant organisers, ECOTRAIL. Not only were they lovely, friendly people but they organised a mean race too, from start to finish. I love the hub bub and buzz leading up to these races – the excited chatter on the bus, the hopeful faces and the nervous ones too. The start was in the shadows of the imposing XV century Manzares Castle with fantastic views over the plains and hills all the way back to Madrid and the iconic 4 towers finish line. The sun was already up as I made my way back to the back of the start line – it was going to be a beautiful day although I was glad of my jacket. Some encouraging words over the tannoy in Spanish from the organisers and then the familiar countdown started – 3, 2, 1 and we were off! I had written the cut offs on my arm so I knew exactly what I had to do and I was determined to keep to the game plan and to just take one cut-off at a time (to use football parlance!). So I had 2:45 to do the first 18km and I wanted to be about 30 minutes inside that so I could build up a reserve for the marathon section which I knew would be challenging. The best way of describing the trail is “Spagetti Westernish” if that’s makes sense. So brush and scrub, a well worn path made up of dirt and rocks and relatively gentle undulations. There were only about 200 starters so it was easy enough to get into a rhythm and go at my own pace. I didn’t panic as people started to pass me as I knew that there was a long long way to go. The first checkpoint came and I was 35 mins ahead of the cut of – exactly where I wanted to be. I didn’t dawdle as I knew that a minute here and a minute there could be vital (how true that proved to be). The next stage was short with little elevation and a very generous cut off and this is where I wanted to push it. I was running pretty much on my own but I was happy with this and I felt really strong. The weather was perfect, the early morning chill had gone, the views were spectacular, I could even see the four towers in the dim distance – what could possible go wrong. I flew through the next checkpoint, having re-fuelled and tried to eat something but I just wasn’t hungry. I checked the watch and saw that I was now over an hour ahead of schedule, perfect just where I wanted to be. I was still busy congratulating my self when one of the organisers tapped me on the shoulder – “are you retiring” he enquired, “it’s just that you’re heading to the car park and the next stage is 180o in the opposite direction”. As I set off (in the right direction) my mind was mass of calculations. I wanted to get to the marathon mark with at least 30 minutes in hand to tackle the night section so I could afford to slow down, conserve my energy and take stock. I still felt great, but I knew a blister was forming on my right middle toe and I was concerned that I was struggling to eat although I was doing well with the water and the salt tablets. This section wasn’t as remote as the first two and it was well marked so I ploughed on. I was still more or less on my own but there were a couple in front of me who kept pace with and unusually there were runners behind me too! This ‘marathon’ section was a bit flatter than the first two although it did have a couple of steep bits to negotiate but I still felt strong as I steamed into the checkpoint 53 minutes ahead of the cut off. I forgot the pain in my toe and the feeling of nausea (I had barely managed to eat anything since the croissant I had had 8 hours earlier) as I realised that this was on. There was still a lot to do and I had to negotiate the tricky night section but I was still in the game. I didn’t dawdle but filled up my water bottles and managed to eat a couple of jelly babies and a segment of orange. The nuts sadly didn’t stay down (a worlds first for me!). So as I set off it was calculation time again – the next and final cut off was 25km away but there was an interim water stop in 12km so that was my next target. It looked tricky too with some roads to cross and a sortie into a military training ground to boot. I had visions of me coming face to face with a tank before I got back to the job in hand. I was slowing now but I had over 5 hours to reach the cut off but part of that wold be at night and I wanted to try and leave 3 hours to do the final 16km. I was still very much on my own but I knew that the field had been whittled down to about 120 from the original 200 so it wasn’t too surprising and I knew too that I was probably bringing up the rear. I passed a super fit runner who was limping with a knee injury. I asked if he was OK and I’m ashamed to say that I was relieved when he told me he was fine and was stopping at the next checkpoint. For the first time I started to understand why Everest climbers could so callously abandon fellow climbers in their quest to get to the top. But I like to think that I would have walked with him if he had asked me to. I barely stopped at the interim water stop ever conscious of the clock ticking way and the maxim “time waits for no man”. By now it was dusk and starting to get colder. I kept my head down and pressed on running on the flat sections and downhills and walking on the uphills. I had hardly seen another soul when out of the gloom came some elegant riders on imposing horses finishing their evening hack. If they were surprised to see this panting, sweat soaked Englishman the were too polite to say anything and after we exchanged greetings we went our separate ways. I had learnt from my TP100 races the perils of getting cold and took a few precious minutes to put on a top and jacket and fish out my head torch. I knew from my watch that I was within half a kilometre of the final check point but disaster! I was lost and couldn’t find the path. I tried to retrace my steps but there were paths everywhere. At that moment I saw some lights in the distance – so there were people behind me. I headed towards three runners and tagged onto the back of them as we headed towards the checkpoint. I had been give another chance. As I took a final slug of water (I had give up on food at this stage) and took stock. 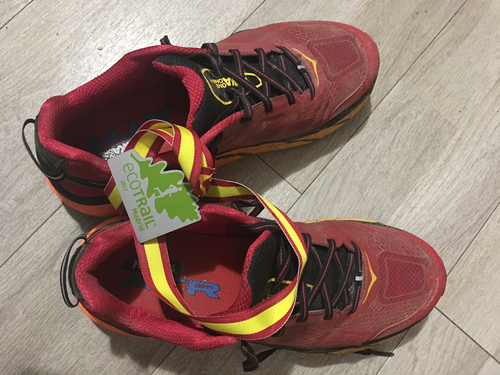 The maths was simple – the sojourn off piste had cost me a few precious minutes but I still had 2 hours and 55 minutes to complete the final 15km, back at home this would take me 90 minutes but I had been running for nine hours and it was night; Still I had a real chance. We left the checkpoint as one but one of the runners hung back and was clearly struggling. I latched onto the back of the remaining two and decided to see how things would play out. After a few km it was apparent to me that I was feeling stronger and could run past them but I was so aware of getting lost. Those that don’t run these extraordinary distances often think it is a case of setting off, running for 12 hours and calling it a day. But it is the constant need to make a myriad of decisions when you are exhausted, often in excruciating pain that is the difference between success and failure – the margins are that tight. More mental arithmetic and I worked out that at the current pace if we didn’t get lost we would just squeak in. My mind was made up and wherever they turned I turned when they hesitated I hesitated, I became their shadow. Eventually they realised that I wasn’t going anywhere and my two new friends welcomed me with open arms. It transpired they were locals and knew the route well and Miguel, having heard my story, guaranteed that he would get me to the finish before the cut off. We pressed on towards the 4 towers which were getting ever closer and my other companion, Diana, assured me that we were just 4km away. By now the sweeper was on our tail but on and on we went with the clock getting ever closer to the 13 hour mark. Then disaster, a final twist …. I saw a sign saying 80km race with an arrow pointing up the hill but we were going in the opposite direction. I kept quiet but the others and the sweeper picked up the mistake and we were soon back on track. Tick tock tick tock the clock got ever closer to the hour but we were in the shadow of the towers, the barriers came into sight and I could hear the loud rock music pumping out. We were going to do it! My lovely friends insisted I went over the line before them and I was so glad to see the struggler from the last checkpoint squeak in too. 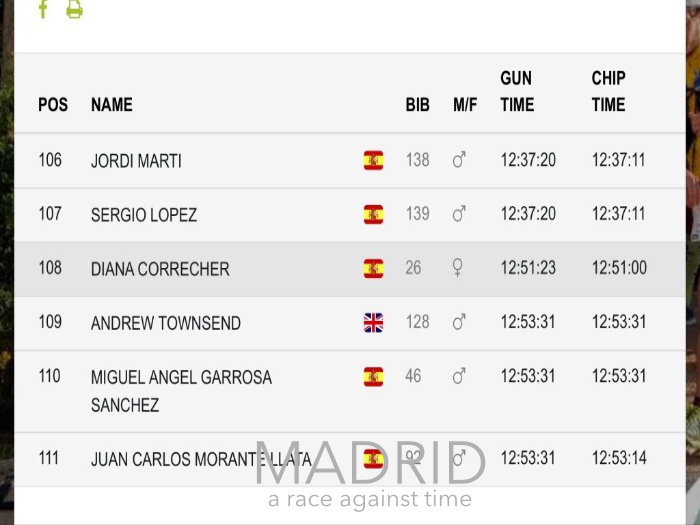 So the bare facts – first and last Englishman and I had made it by a breathless 6 minutes 29 seconds. What a finish what a day – and …… I was back in the game! What a fantastic achievement congratulations and to overcome the pressure to make the cutoffs. Extraordinary. Be very proud. Wow thanks Lisa. Please share away! The more people we can persuade to give up a sedentary lifestyle and pursue their own adventure the better!